Burnout among coaches is a “brain drain” on the sport. Athletes may suffer if coaches are burned out. Understanding causes of burnout are critical for long-term development and retention of coaches. Swimmers Burnout? and How to Prevent Swimming Burnout) Many swimmers hang up the goggles long before reaching their potential. Sometimes frustration due to injury discourages swimmers from pressing onward. Other times, burnout is purely mental, where a swimmer is fed up with staring at the black line and living by the strict rhythm of the pace clock. Now, no one said swimming (or any sport) at a high level is easy, so attrition is a natural byproduct of rising through the ranks. But most would agree that burnout is far too common. Veterans of the sport all know several swimmers who left the pool early with unmet physical potential. 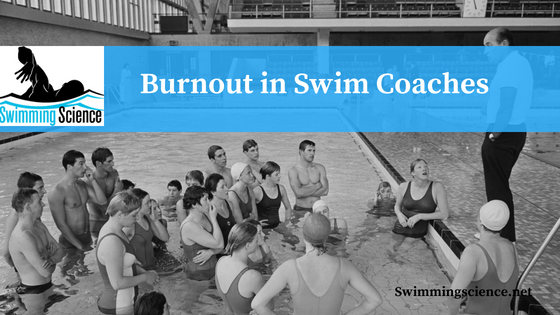 Burnout among swimmers is frequently discussed, but what about burnout among coaches? Coaching swimming can be a tough gig…long and irregular hours, lost weekends, external pressure (parents, institutional, athletes). As a result, many coaches leave the profession before reaching their potential as coaches. This topic is especially poignant with many coaches desperately looking forward to some rest and relaxation after the summer season. If a young coach leaves the sport due to burnout, many mentorship hours have been squandered in the process. Secondly, burnout is not sudden, and many coaches aren’t able to give their athletes their very best if they are on the road to burnout. Additionally, potential coaches may be discouraged from entering the field if they suspect burnout will occur, which can contribute to negative self-fulfilling cycles. Though swim coach burnout has not been a hot topic in research-land, there is still much to learn from other sports that have been studied. A survey among Turkish judo coaches (Gencay 2011) revealed “moderate” levels of burnout among those studied. The point here is not to study judo, but instead to explore generally why do coaches burnout? Malinouskas (2010) found similar correlations among university coaches, with experience greater than 10 years being related to burnout, though gender was not related to burnout. Yet burnout has many dimensions beyond strictly mental depletion. Tashman (2010) studied coaches from multiple sports and found that maladaptive perfectionism (as contrasted with adaptive perfectionism) was linked to burnout. Additional research from the world of athletic training also can offer insight. Though athletic training is a completely different field than coaching, the job stresses are very similar: long irregular hours, the pressure to perform, low to moderate pay relative to time worked. Some of these factors are inherent for any job at high levels of the sport. Travel and long hours are unavoidable, but other stressors can be managed. One similar theme that emerges is the role of leadership. In the coaching context, head coaches and administrators can shape the future of assistant coaches. Despite the dark and gloomy tone of this article, most would agree that more viable opportunities exist in the coaching field than in the past. Performance levels among young swimmers continue to elevate, in part due to more free access to knowledge for young coaches. But the sport can always do better in cultivating young coaching talent. Understanding what potentially drives some coaching prospects out of the field is one step in the right direction. Gencay S1, Gencay OA. Burnout among judo coaches in Turkey. J Occup Health. 2011;53(5):365-70. Epub 2011 Jul 20. Malinauskas R1, Malinauskiene V, Dumciene A. Burnout and perceived stress among university coaches in Lithuania. J Occup Health. 2010;52(5):302-7. Epub 2010 Aug 6. Tashman LS1, Tenenbaum G, Eklund R. The effect of perceived stress on the relationship between perfectionism and burnout in coaches. Anxiety Stress Coping. 2010;23(2):195-212. doi: 10.1080/10615800802629922. Mazerolle SM1, Bruening JE, Casa DJ. Work-family conflict, part I: Antecedents of work-family conflict in national collegiate athletic association division I-A certified athletic trainers. J Athl Train. 2008 Sep-Oct;43(5):505-12. doi: 10.4085/1062-6050-43.5.505. Mazerolle SM1, Goodman A. Fulfillment of work-life balance from the organizational perspective: a case study. J Athl Train. 2013 Sep-Oct;48(5):668-77. doi: 10.4085/1062-6050-48.3.24. Written by Allan Phillips is a certified strength and conditioning specialist (CSCS) and owner of Pike Athletics. He is also an ASCA Level II coach and USA Triathlon coach. Allan is a co-author of the Troubleshooting System and was selected by Dr. Mullen as an assistant editor of the Swimming Science Research Review. He is currently pursuing a Doctorate in Physical Therapy at US Army-Baylor University.